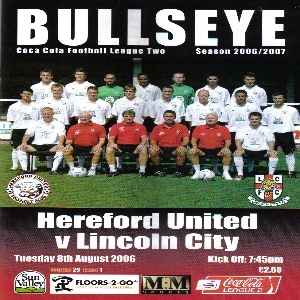 There's nothing quite like interupting a run of familiar grounds than to visit a ground you know very little about and that was the case when City were the first visitors to newly promoted Hereford United. Pictures of the ground that I'd seen on the internet hadn't really revealed a lot about the ground and I was slightly pensive about visiting this ground. 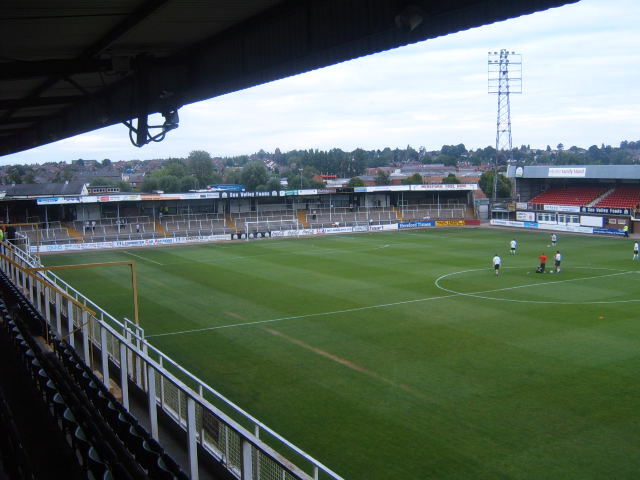 After a length journey, we finally arrived at Edgar Street but the outside view of the ground did the stadium no favours what so ever. 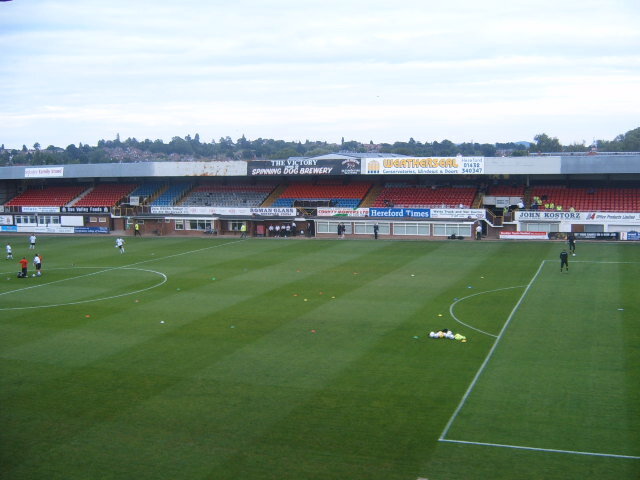 Getting off around the other side of the ground, we were forced to walked around through the Hereford fans but to be fair, there was absolutely no trouble, no comments of a vulgar nature that I could hear and I'd only experienced something like that whilst at Kidderminster Harriers. I should note though that in my second visit I went in the car with someone who didn't have a sat-nav, and there are no signs to the ground whatsoever, making it extremely difficult to find the ground. The turnstile system confused a lot of people because there were different turnstiles for the terrace and the seating but there was no indication as to which was which and fans only found out when they got their tickets. 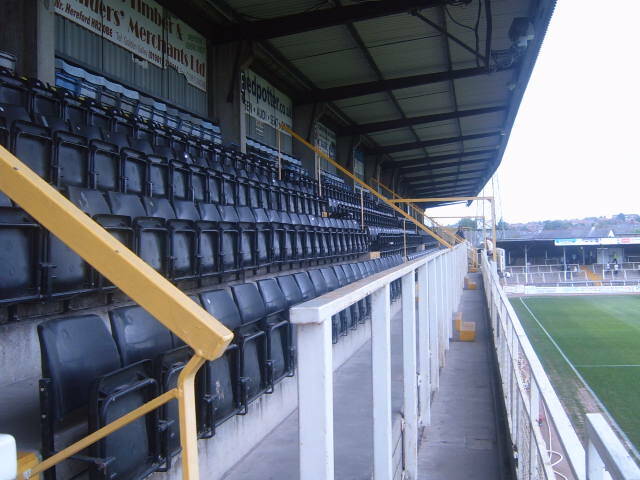 Interesting though, fans could pay the cheaper price for terracing but then walk up the stairs to the seating simply because there was no-one guarding the stairs until just before kick off. I had gone into the seated section for this game but was totally unprepared for the steepness of the stand. I thought Carlisle was steep but this was ridiculous and you always felt like you were apart to fall down but at least it offered a good view of the action, however, there was no indication as to where the away end stopped and the home end started and this caused much confusion. 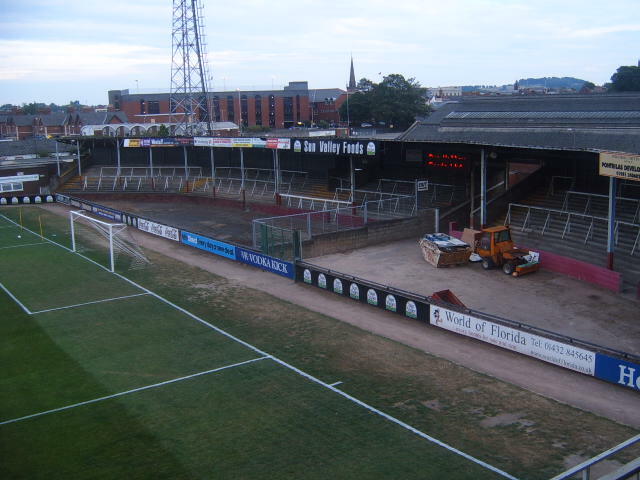 Behind both goals were terraces and the one nearer to the away fans was curved and far back from the pitch and very few fans were in this stand and it looked like the stand was about to fall down. The other terrace was the main congregation area for the home fans and this was again curved but not as far back from the pitch. The final stand was similar to the side stand at Boston in that was a small elevated stand. Atmosphere at Edgar Street was fanastic on my first visit and although you can't understand what they're saying, they were loud as hell if even when losing, the atmosphere was really good and the cheering when they score was also fairly loud. However, it must be a lot different in non-league because I can't recall hearing fans moan as much as this and it must be a world record for "handball" shouts. Overall, Hereford isn't bad but is definitely no higher than Conference standard. Some of the facilities, and not to mention the method of doing things such as the fan segregation definitely isn't up to much and that's what denies this from being one of the more welcoming venues in the lower leagues.